If this easy, gluten-free French toast isn’t on your weekend menu, get on it! My son recently spent the night at a friend’s house and the mom served French toast for breakfast. My son, apparently, thought this was the best thing he had ever eaten in his entire life and ate so much of it I had to assure my friend that I do, in fact, feed my children regularly. What was more disconcerting was that Quinn claimed to have never eaten French toast before! Mon dieu! How is that possible? I immediately set out to remedy the situation. I have always loved French toast. As kids, we thought of French toast as a special treat because we didn’t really get to have it very often – not because it is difficult to make, only because we rarely had an entire loaf of bread at the ready on a Sunday morning to feed the six of us. It was much easier to make pancakes or eggs before church than to run to the store, grab bread, come home and make French toast. That’s probably the same reason French toast hasn’t made the breakfast rotation in our house, either. Until now. 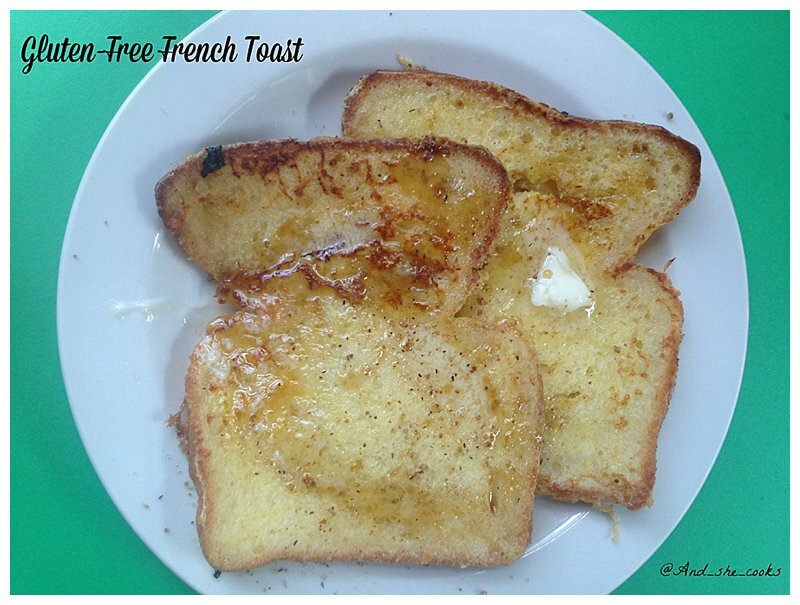 Gluten-free French toast is one of those easy breakfasts that is made easily with “regular” bread or quickly converted into a gluten-free option. All you need is your favorite bread – gluten-free, of course – white, multi-grain, cinnamon raisin – any type will work, and some milk and eggs. Truly – it’s that easy. Some people use half and half instead of milk. Half and half or any type of cream is a valuable commodity in my house – reserved for mommy’s coffee. Step away. For this recipe, I stick with milk! Use your favorite sweetener – sugar, brown sugar, or warmed honey – you only need a little bit. I also like to add cinnamon and nutmeg. It’s so simple, I’m even guilty of serving this for dinner… Add some local sausage and fresh fruit and you’ve got a well-balanced meal, right? Enjoy! 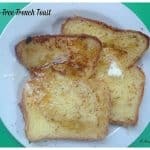 To make the simplest of simple French Toasts … I use a simple ratio of 1/4 cup milk to 1 egg and a dash of vanilla. To make a bigger batch, double the ratio. One of the most delicious breakfasts is also the easiest! Whisk together milk, egg, vanilla, cinnamon, and salt in a large bowl. Melt some butter in a skillet. Dip bread - one side at a time - into the milk and egg mixture. Try to catch all the drips in the bowl. Cook over medium high heat for about 4 minutes on the first side. When the bread releases easily, flip it over. Cook well on the second side for a couple of minutes. Serve with butter, honey, and your favorite fresh fruit!